A lovely cottage with private backyard, loads of parking and total privacy. Fully self sufficient and only 5 mins from CBD or ten metres to the waters edge! Operating for the past ten years! Totally renovated. repainted, new kitchen, new bathroom, new floor. The newest park I Hobart has just been built ! Kids love it. Views and walks over to the sparkling waters of Lindisfarne bay towards the mountain. Beach Rd Cottage overlooks Lindisfarne Bay, the River Derwent , Mt Wellington & Tasman Bridge & yet is just 6 minutes by car from central Hobart. It is set in the grounds of a heritage listed Californian bungalow home that is a unique example of between wars (1925) architectural home in the elegant and quite suburb of Lindisfarne. Within 100 metres of the Hobart Rowing Club and Lindisfarne Yacht club and marina. 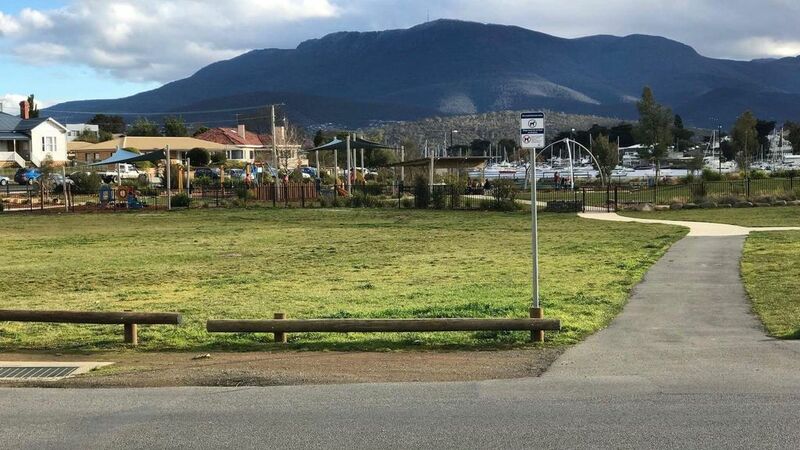 Across the road from the Lindisfarne Esplanade Park grounds with beautiful views of the Derwent River and Mount Wellington. It is also convenient to the Hobart Airport- a drive of 12 minutes & so it is good for arrivals & departures as well as your Hobart base. Cottage contains two main rooms with queen size bed, lounge suit, television,kitchen table and cooking facilities and washing mashine. Outside is a front porch and back porch. Outdoor furniture and bbq. The cottage is close to the main house but private and very quiet. Suits the needs of everyone. Sleeping is also in the loft where there is a queen size bed. Suitable for adults and children alike. More beds available if you like a trundle ! Child friendly. The yard is big and the park is accross the road. Lindisfarne is a lovely Hobart suburb facing the mountain. Within walking distance or 5 minte drive of the cottage are supermarkets, gym facilities, parks, newsagency, postoffice, dry cleaners, banks, bakeries. It is a world of its own within 5 mintes of the city centre ! A queen size bed is in the room downstairs. AND up in the loft where there are fabulous views is a queen bed and setting. Chn over eight years old love the loft. Adults as well. It is suitable for 8 year olds and older. Not only chn stay there as it is quite comfortale and private. But the whole area is open. Please make sure you understand the whole area is open. The mezzanine area has a double bed, is cute when you are up there, but the ladder takes you up. It is not suitable to have young chn in the area as they may use ladder. Lots of families have stayed as the rates are good and chn as well as adults like being up on the mezzanine level to sleep and read etc. Spare mattresses are under each bed or extra people. I charge a flat rate. No extra hidden costs. The sofa bed is a simple one ....more suitable for chn than adults. We try to make sure you have everything to ensure you are independent and your stay is as private as you want. Our visitors find this a quiet place - close to the city but away from the noise. A beautiful spot for everyone. Walk the bay and feed the ducks, or eat at the yacht club. MONA a quick trip around the back way. About 10 mins. PARK ...brand new attraction across the rd. Nice little cottage in a quiet area with a great view and park for kids. There is a great cafe within walking distance. Too small for 4 people. Best suited to a couple. The ladder to the loft encroaches on the dining table. It is difficult to access the loft. The ladder moves when its being used. The ceiling is very low in the loft and the foam mattress on the bed is thin and uncomfortable.There is no laundry, just a washing machine under the back porch. No dryer, just a small clothes line in the back yard. The property is unsuitable for anyone who is a large build, due to the smallness of space and the amount of furniture in it. The property is the size and layout of an open plan studio. The hanging space consists of a small mobile clothes rack. Nice seating out near the back door. The nearby park was lovely. Lindisfarne is a lovely suburb. Nina is sociable and chatty. Her dog is friendly. Delightful stay. Parks & footpaths Shops close by. Had a birthday party in Simmons’s Park. So just a walk away. Walked for coffee or to Lindisfarne village for shopping. Very Scenic walk up to Bridge with Mt Wellington in background. Great stay. Cozy little cottage, close to shops, a brand new play park that my teenagers enjoyed and easy access to Hobart and surrounds. It has A/C and a ceiling fan. This is a compact little cottage on the owners property. Great bird life and positioned on a quiet road. Although there is a loft it is not suitable for small children.